The Revolving Museum of Fitchburg is revealing a nearly one-ton plane Tuesday at the Fitchburg Municipal Airport. Residents of a Massachusetts city are hoping to set a world record for the largest paper airplane. The Revolving Museum of Fitchburg revealed a 64-foot-long plane at the Fitchburg Municipal Airport on Tuesday. There was no plan to fly the nearly 1-ton contraption. 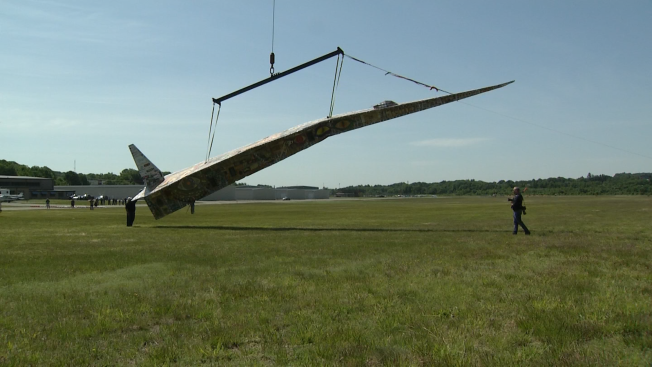 Fitchburg artist Jerry Beck told the Sentinel & Enterprise he wanted to break the world record for the largest paper airplane to take flight but the hangar it was built in was too small to accommodate a wide enough wingspan to support the glue-shellacked plane. The plane project is meant to spotlight Fitchburg's history as a major paper producer. A construction crane held the plane aloft. Two people measured the plane at 64 feet and 6 inches long, which Beck says makes it is the largest of its kind. He's asking Guinness World Records to add a new category. Guinness World Records says the largest paper aircraft was built by students and employees at the Braunschweig Institute of Technology in Braunschweig, Germany in 2013. It takes several weeks for Guinness World Records to review record attempts.